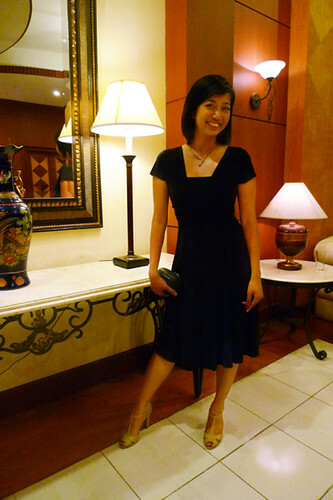 Black dress, Kirei, P2000++. Strappy sandals, a gift Ana. Red accessories, borrowed from Karess. Every time I’m reminded of the price, I feel my bank account crying. But the dress is definitely worth it! Agree? I think I tried out around 8 dresses before getting to this one. Some of them I put on and took in a matter of seconds, but some I actually considered. I narrowed it to the top 5 to the top 3 until I finally decided on this one. Haha! Like I said before, I don’t really do dresses unless I really needed to. But when I need to wear them, I actually like how I look in dresses. With this dress… I LOVE how I look in this dress! This is my dress for Cocoy and Estela’s wedding. Their theme was black and red. Title from “That’s when I Love You”, Aslyn.